We have a lot to talk about this time around, so let’s get right down to it. If you’re looking for some background noise, this week’s episode of TheLines Podcast is a good one, including an interview with MGM bookmaking boss Jay Rood. Click play and keep scrolling. New York has been the elephant in the room for months. It’s one of the few states that passed a sports betting law while PASPA was still on the books. Policymakers have since taken no measurable steps toward implementation, though, even as newly regulated markets opened in neighboring New Jersey and Pennsylvania. This week brought another apparent stall, as Gov. Andrew Cuomo excluded sports betting revenue from his budget for the fiscal year. LSR this week obtained a draft of proposed rules for NY sports betting, which the Gaming Commission will finally present in public on Monday. Nothing in them is especially surprising, so we have a fair sense of how the industry will look when it rolls out. Unless an underdog legislative effort materializes, there will be no online/mobile sports betting in New York in the short term. Sorry, friends. What’s up at the DOJ? The eyes of gaming stakeholders are trained on the US Department of Justice and its Office of Legal Counsel these days. Last week, the OLC reinterpreted the Wire Act in a way that could have broad ramifications for the industry. Or it could do absolutely nothing. Who knows? There wasn’t much news to advance the story this week, but we do expect the DOJ to clarify its plans for enforcement sometime soon. Wow, there has been lots of sports betting action around the country already in 2019. Lots. Of. Action. Almost 20 states already have legislation on file, and the lawmaking session is only just beginning. We’ll try to tour the country bit-by-bit over the coming weeks, starting with a few of the more imminent efforts to legalize and expand. Connecticut: Here’s another state with a pre-SCOTUS law on the books just itching for implementation. Lawmakers are working to pass additional legislation this year that would clear the remaining tribal and constitutional hurdles to launch. District of Columbia: The DC mayor signed the bill that authorizes sports betting in the nation’s capital, sending it to Congress for review. Lingering concerns about the lottery’s implementation will be the subject of a public hearing on Monday. Mississippi: Sometime soon, Pearl River Resort will launch the state’s first sports betting app. Bettors will only be able to use it within the four walls of the tribal property, but it could provide some proof of concept for expanded online wagering in the future. Michigan: The sponsor of a recent sports betting bill says the new Wire Act opinion is “bunk.” In a chat with LSR, Rep. Brandt Iden insisted that the “scare tactic” will not affect how his state proceeds with related legislation, including a Michigan online gambling bill. As a reminder, our sports betting bills tracker is updated daily to reflect all active legislation nationwide. Oh, also! 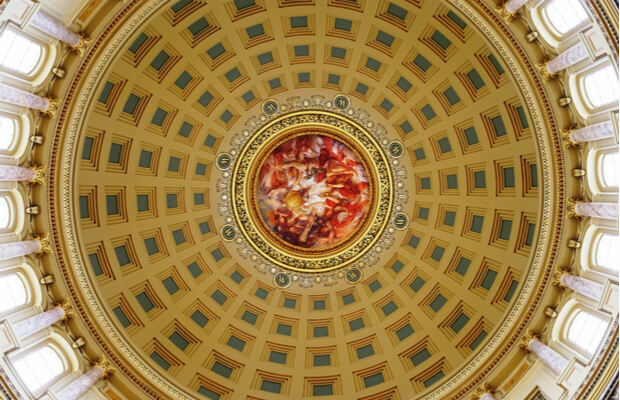 We’ve started compiling a little legislative update for your reading enjoyment. The first edition this week includes a look at new bills in Arizona and Hawaii among other morsels of lawmaking news. The latter seems like a long shot considering it is one of only two US states with no legal gambling of any sort. Phew, this thing is getting a little bit wordy already. There are a handful of other things that need highlighting before we part ways, though. There are more than a handful, really, but we’ll keep it to five in the spirit of brevity. Court jesters: The fact that a group of New Orleans Saints fans has filed a frivolous lawsuit against NFL officiating is mostly a non-story by itself. The public reaction to the error, however, underscores why it’s such a bad idea to anoint leagues as the guardians of betting integrity. Square bettors: The two DFS leaders continue to drive the majority of US sports gaming innovation. This year, DraftKings is running a free Super Bowl squares contest, a no-brainer way to drum up some new/crossover customers. In your ears: Sports betting is expanding across the airwaves, too. SportsGrid has a new partnership with Elvis Duran that will bring the conversation to the top-rated top-40 morning show in the US. We’ll do it live! : The new DraftKings Casino has teamed up with Evolution Gaming to implement live-dealer games. The relatively new format is all the rage among NJ online casinos these days. That’s all she wrote, ladies and gents. Follow @LSPReport on Twitter to keep up with the news in real time, and we shall return at approximately this time next week to do it all over again.